THE COLORS MAY VARYNo more picking up pins one by one sweep them up with Grabbit.No more stopping work to push pins into a cloth cushion drop them onto Grabbit.No more shaking, tipping, fumbling for pins theyre right there, ready on Grabbit.No more chasing lightweight cushions heavyweight Grabbit stays put.Grabbit Magnetic Pincushion is an industry-recognized tool for storage and access to sewing pins. Consumers have been happily using Grabbit for over twenty years as their primary pin keeper. The unique attribute of Grabbit is its powerful magnetic field which sweeps up pins from a distance and aligns them in an organized pile. It is easy to grab a pin or throw one back on the Grabbit surface when you finish.Grabbit has a pleasing contemporary design with a shallow bowl surface to gather pins and a comfortable round shape to hold in your hand. 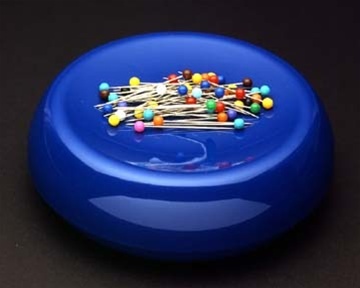 It is stocked with 50 color ball pins. The pins have ample sized 4mm plastic heads and are 1 1/2 inches long. Grabbit is safe near computer sewing machines. Magnetic fields will not affect computer chips and many sewing machines actually have magnets in the inner workings. Grabbit comes in a variety of colors and meausres 1 5/16" tall, 4 1/4 diameter.